These fun Santa belt cupcakes are an easy and super fun way to bring the ho ho ho to your Christmas holiday! The perfect Christmas cupcake has arrived! 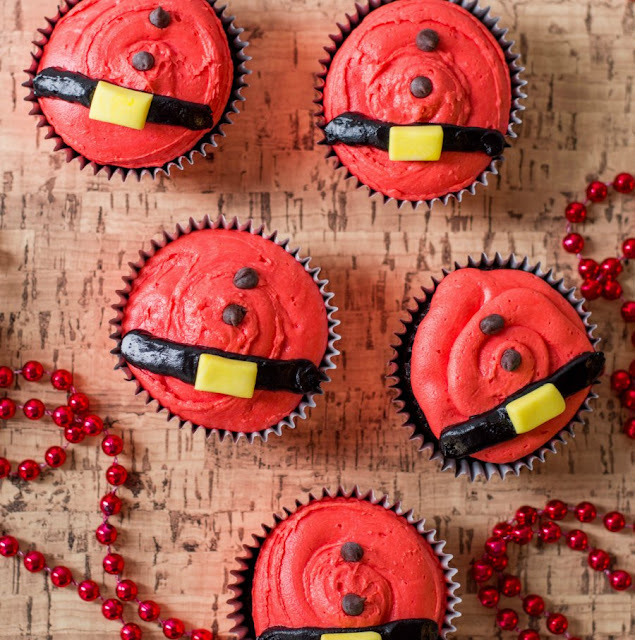 These cute and fun cupcakes look like Santa's belt. Spread the delicious magic of the season and bring these to all of your Christmas parties. They'll definitely be a hit at classroom parties as well! As hard as it is to believe, the Christmas season is upon us. Thanksgiving is behind us and we are staring down the barrel of all things jolly now. The tree and lights are up and the decorations are finding their way to every nook and cranny. The season of magic is upon us. It is also a time of year where the calendar fills up fast with holiday party after holiday party. It is fun even if it is a bit exhausting. Each of those parties requires food and the more festive the better! That is where these cupcakes come in. You can make them super easily. Heck use a cake mix for the cupcakes if you want. I do suggest trying my doctored up cake mix recipe for semi-homemade white cupcakes though. They are soooo good! Or make them chocolate like these pictured, my devilishly good chocolate cupcakes are almost as easy as a mix but they are homemade. Either way, get your cupcakes ready and whip up some frosting. Your favorite buttercream is the way to go here. It would be great with sweetened condensed milk frosting or the best American buttercream. 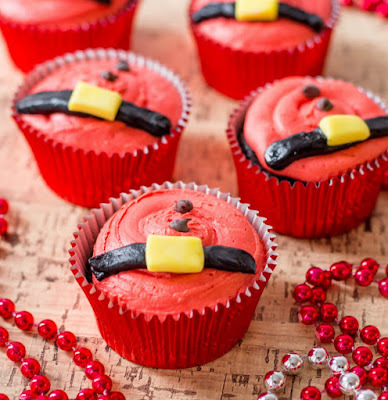 Anything that you like on a cupcake and can dye red and black will do. I have to admit, getting red frosting is a bit of a pain, but it can be made easier if you know a few tips. So lets talk red frosting for a minute. The first thing is the frosting color will deepen a little as it sits. So you are welcome to stop adding food coloring a shade or two before you get there. For food coloring, I always use the food gels. The color is more concentrated and there is less concern about making the frosting too loose adding bottle after bottle of liquid coloring. If you are nervous about adding that much food coloring, add a little cocoa powder to your frosting first. That way you don't have to transition all the way from bright white. Just don't add so much that your frosting is more than a light tan if you are shooting for a bright red Santa suit color. I added a Tablespoon or so to make the red frosting for the Grinch's Santa hat. The same idea goes for the black belt. If you don't want to use so much black food gel, start with chocolate frosting. This time you can go as chocolaty as you'd like. In a pinch, a tube of black frosting from the cake mix aisle will do. If you really don't want to mess with coloring the frosting, most grocery store bakeries will sell you little tubs of theirs. It won't taste quite as good as my homemade frosting 😉 but the cupcakes will be so cute that people won't care. For the belt buckle you have options as well. You could get a bit of fondant or you could do what we do when decorating our gingerbread houses each year, get creative! Any soft and fresh chewy candy will work here. We've been known to roll out Starbursts, Laffy Taffy and more. Then just cut out the shapes. Of you still have some Halloween candy laying around and it's too hard to roll out, a few seconds in the microwave should help. 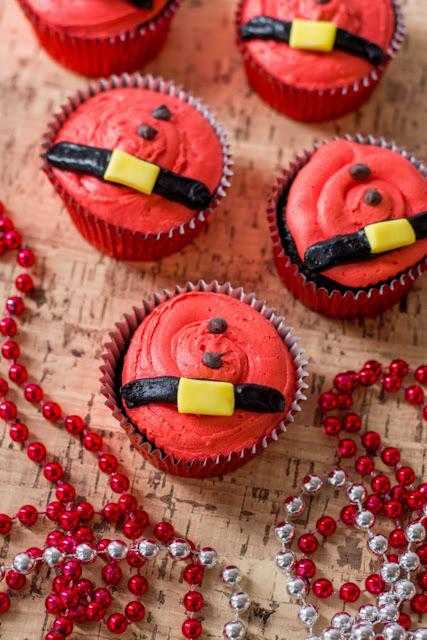 Now get your cupcakes in the oven and while they bake, check out the rest of these Christmas party food ideas. There are all sorts of tasty recipes below the recipe card! Make sure your cupcakes are completely cool. Pull out about 1/2 cup of frosting and dye black for Santa's belt. Adding some cocoa powder to the frosting first will keep you from having to add so much food coloring. Dye the remaining frosting red. 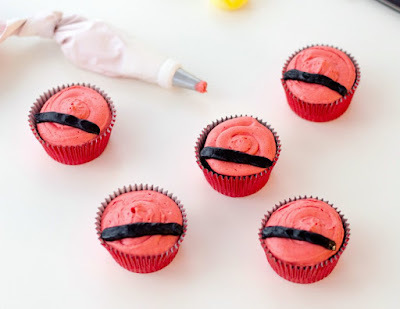 Either spread the red frosting over the cupcakes or pipe with a round piping tip. 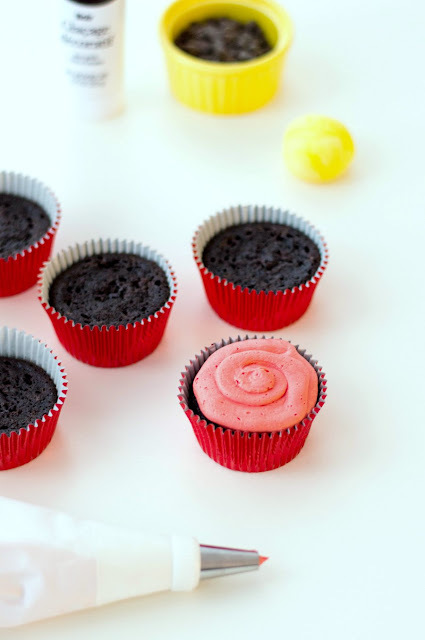 Using a small flat tip, pipe a black belt about 1/3 of the way up the cupcake. 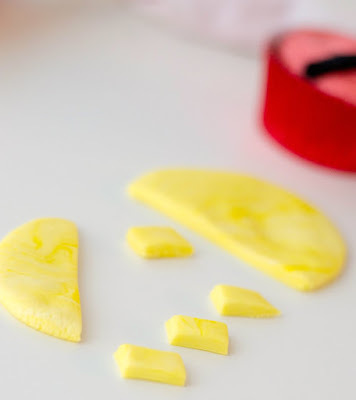 Roll out the fondant (or yellow candy) and cut into small rectangles. About 1/2 by 1/4" is a decent size, but you can just eyeball the size that looks good with your belt. Place in the center of the black stripe. Add two mini chocolate for buttons above the belt. You brilliant lady you. Santa Sensational, I LOVE them! I am so into Santa this year that they go perfect with my holiday decorations. Except with my sweet tooth they won't last long. My sweet tooth didn't let them last long here either! What a super fun idea! Now I need to find a sleigh for my buffet! They really are quick and easy! This are so fabulous! I love all things Santa! Me too, it is just such a fun and festive time of year! These are so festive and fun. I love the tip about using rolled out candy instead of fondant! We always do that for our gingerbread houses, it would work great for cupcakes as well! These are so cute! I love anything Santa. I always use Wilton gel colors, but I might have to try the ones you suggested. I have some Wilton gels and like them too, but I love the convenience of the squeeze bottles. this is so festive and cute! love it! I love it when everything comes together around a theme! These are adorable and just perfect for the holidays. Thanks so much for sharing with us at the Happy Holidays link party. Pinned. Your Cupcakes look adorable! Hope you are having a good week and thanks so much for sharing with us at Full Plate Thursday! I love your tip of adding cocoa to the frosting to help with the color! I will be trying that one! That way you don't have to go all the way from bright white! Let me know how it goes for you! So cute. I love Christmas baking! Me too, it's so much fun! Those are just darling! They'd be fun to make with kids or grandkids!